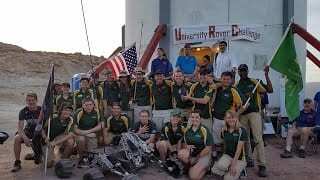 After three days of intense competition under the hot desert sun, the Mars Rover Design Team (MRDT) from the Missouri University of Science and Technology became the first team from the United States to win the University Rover Challenge (URC) since 2010. 35 rovers and more than 500 students from seven countries descended upon the Mars Desert Research Station (MDRS) in southern Utah for this annual competition which asks college students to design and build the world’s best Mars rover. Poland was represented on the podium for the 5th consecutive year, as the PCz Rover Team from the Częstochowa University of Technology won second place. Brigham Young University (BYU) from the United States earned the third position, marking the 6th time they have finished on the podium. The international robotics competition for college students, which is part of the Mars Society’s Rover Challenge Series, featured an elite field of teams vying to build the world’s best student-designed Mars rover. A record 82 teams from 13 countries took part in URC2017. Following a rigorous two-stage down-select process 36 teams were invited to the field competition at MDRS. 35 teams from seven countries arrived with their rovers ready for the exciting challenges in the Utah desert. For its eleventh year URC introduced two new tasks: the Extreme Retrieval and Delivery Task, designed to support astronauts by delivering a variety of items across aggressive terrain; and the Autonomous Traversal Task, the first time that a fully autonomous capability has been required at URC. MRDT, in a display of exceptional engineering and execution, earned perfect scores in each event. Other tasks included an Equipment Servicing Task in which teams were required to perform maintenance on notional field equipment that involved fine motor skills, and a Science Cache Tasks in which teams were required to search for signs of life in a method similar that is applicable to Mars exploration. The latter event is particularly unique in that teams of engineers work with their scientist counterparts to understand the unique requirements field science. More than 1000 students were involved in URC projects at their local universities during the 2016-17 academic year. The rovers they built reflected the dedication, passion, and ingenuity of the student teams, a point that was not lost on the judges and industry representatives attending the event. The scores for all teams can be found on the URC web site. For more information, visit URC online at: http://urc.marssociety.org, on Facebook (https://www.facebook.com/universityroverchallenge), and on Twitter (https://twitter.com/URConMars).